TECTA™ is an automated microbiological platform that uses patented Polymer Partition technology to rapidly and reliably detect E. coli, Total Coliforms, Faecal Coliforms and Enterococci contamination. Available for testing 4 or 16 samples, this platform is simple, sensitive and flexible, allowing for testing of samples at any time of the day. TECTA™ will automatically transmit data allowing for immediate notification on electronic devices, such as mobile phones or laptops, as soon as a contamination event is detected. TECTA™ B16 is a complete, self-contained automated microbiology testing system capable of providing laboratory-grade results on-site with unprecedented time-to-result performance. The TECTA B16 has a capacity of up to 16 simultaneous tests for presence/absence with optional quantitative reporting in CFU per 100ml on positive results. Full automation of the test analysis and interpretation processes eliminates the need for subjective, visual interpretation of results. 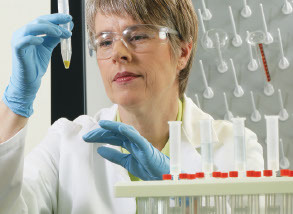 An objective, written test report is produced for each sample tested. Extreme ease-of-use means that even non-technical personnel can initiate testing and perform all required quality assurance procedures to ensure laboratory-grade test results. lab-equivalent microbiology testing has never been this easy and accurate. The TECTA™ B4 has all the features and benefits of the larger TECTA™ B16 but with only four testing compartments, giving it a much smaller footprint. Similar to the B16, the TECTA™ B4 is a complete, self-contained automated microbiology testing system capable of providing laboratory-grade results on-site with unprecedented time-to-result performance. The cost-effective B4 is ideal for situations where multiple locations need stand-alone units or when testing requires the unit be transported to various external sites. In the lab, the unit has a much smaller footprint freeing up desk space while still performing the same high standard of testing as the larger model. Tecta is a self-contained ‘lab in a box’ device that houses four (TECTA™ model B4) or sixteen (TECTA™ model B16) incubation chambers. It uses a directed enzyme-substrate method combined with a patented Polymer Partition technology that extracts hydrophobic fluorescent product from water. The built in spectrometer is then able to actively read and interpret test results. Receive positive results within as little as 2 hours and confirmed negative within 18 hours directly to your computer, tablet or smartphone. The instrument can be used with just 3 simple steps, add sample, load the cartridge, press start. No microbiology degree is required! Got any of these applications?